In 2012, the "Historic Tampa Cuban Sandwich" was designated as the "signature sandwich of the city of Tampa" by the Tampa City Council. As with Cuban bread, the origin of the Cuban sandwich (sometimes called a "Cuban mix," a "mixto," a "Cuban pressed sandwich," or a "Cubano") is murky. In the late 1800s and early 1900s, travel between Cuba and Florida was easy, especially from Key West and Tampa, and Cubans frequently sailed back and forth for employment, pleasure, and family visits. Because of this constant and largely undocumented movement of people, culture and ideas, it is impossible to say exactly when or where the Cuban sandwich originated. Some believe that the sandwich was a common lunch food for workers in both the cigar factories and sugar mills of Cuba (especially in big cities such as Havana or Santiago de Cuba) and the cigar factories of Key West by the 1860s. Historian Loy Glenn Westfall states that the sandwich was "born in Cuba and educated in Key West." The cigar industry in Florida shifted to Tampa in the mid-1880s, and tens of thousands of Cuban workers moved to the area over the next decade. The first recorded mentions of a distinct Cuban sandwich survive in descriptions of workers' cafés in Ybor City and West Tampa from around 1900, leading other historians to theorize that the sandwich as now constituted first appeared there. Researcher Andrew Huse states that "the old 'mixtos' coalesced into something more distinct – the Cuban sandwiches we know and love – an original Tampa creation." A travel article published by the Mason City Globe Gazette in 1934 said that Tampa's cooking was "much more distinctive than elsewhere in the state" and lists Cuban sandwiches (along with Cuban bread) among the city's signature foods. By the 1960s, Cuban sandwiches were also common on Miami cafeteria and restaurant menus, as the city had gained a large influx of Cuban residents after Fidel Castro's 1959 rise to power in their native land. The Communist Revolution caused a wave of Cuban expatriates to settle in other locations as well, and they brought their culture and cuisine with them. 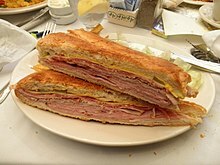 Cuban sandwiches and variations thereof are now served in various Cuban exile communities in places such as New York City, New Jersey, Chicago, and Puerto Rico, among others. While there is some debate as to the contents of a "true" Cuban sandwich, most are generally agreed upon. The traditional Cuban sandwich starts with Cuban bread. The loaf is sliced into lengths of 8–12 inches (20–30 cm), lightly buttered or brushed with olive oil on the crust, and cut in half horizontally. A coat of yellow mustard is spread on the bread. Then sliced roast pork, glazed ham, Swiss cheese, and thinly sliced dill pickles are added in layers. Sometimes the pork is marinated in mojo and slow roasted. The main regional disagreement about the sandwich’s recipe is whether or not to include salami. In Tampa, Genoa salami is traditionally layered with the other meats, probably due to the influence of Italian immigrants who lived side-by-side with Cubans and Spaniards in Ybor City. In South Florida, salami is left out. A 1934 travel article describes a Tampa Cuban sandwich as a "complete meal" consisting of ham, lean pork, Swiss cheese, soft salami, dill pickle and a "liberal moistening of mustard" served on "very crisp and crusty" Cuban bread. These ingredients are reiterated 27 years later in the first and all subsequent editions of "The Gasparilla Cookbook" (1961), a still-popular collection of Tampa cuisine. Mayonnaise, lettuce, and tomato are usually available options throughout Florida menus, but such ingredients are usually frowned upon by traditionalists. A similar sandwich is the medianoche ("midnight") sandwich; as the name suggests, the sandwich originated as a late-night snack, likely in the night clubs of Havana. The medianoche contains the same ingredients as the Cuban sandwich, but is smaller and, unlike a Cuban, is served on yellow-colored egg bread (similar to challah), which is softer and sweeter than Cuban bread. In May 2012, Victor Padilla and Jolie Gonzalez-Padilla organized the first Cuban Sandwich Festival, which was held in Tampa and included the building of the "World's Longest Cuban Sandwich" and a competition for the best Cuban sandwich among local and statewide restaurants. The festival has been held annually since, and the competition has grown to include entrants from across Florida, the US, and other countries competing in several categories. The organizers have also held smaller festivals with preliminary sandwich competitions in Miami and Kissimmee, Florida. In the 2014 film Chef starring Jon Favreau, the main character drives across the United States selling Cuban sandwiches (referred to as "Cubanos") from a food truck called El Jefe. In 2016, Christopher Spata, a writer for the Tampa Bay Times, sent fake press releases to a variety of news organizations and online holiday databases touting a fictional "National Cuban Sandwich Day" as an experiment to see if people would celebrate a "made-up" food holiday. Several news sources and websites added the date (August 23) to their list of holidays, and the event has since been celebrated in a few locations. Spata's story about his experiment appeared on the front page of the tbt* tabloid newspaper in Tampa and was picked up by national news outlets. ^ a b c Three Guys From Miami (n.d.). "Sandwich Cubano / Cuban Sandwich". iCuban website. ^ a b Linda Stradley (2004). "History of Cuban Sandwich, Cubano Sandwich". What's Cooking America website. ^ a b c d Andrew Huse. "Welcome to Cuban Sandwich City". Cigar City Magazine, Volume 1, Issue 2. Archived from the original on 2016-03-25. Retrieved 2016-06-05. ^ a b Daley, Bill (3 October 2014). "Cuban sandwich recipe: How to make the classic". The Chicago Tribune. Retrieved 20 July 2018. ^ a b Richard Danielson, Tampa names Ybor City-style Cuban as the city's signature sandwich, Tampa Bay Times (April 19, 2012). ^ a b c Tom Scherberger, Cuban Sandwich Wars Inflame Passions in Tampa and Miami, Visit Florida (accessed May 31, 2016). ^ a b c d Damon Lee Fowler. "Love at first bite: A great sandwich". Savannah Morning News. Archived from the original on 2013-02-01. ^ a b Otto, Steve (24 October 2007). "Cuban Is Ours, Any Way You Try To Slice It". The Tampa Tribune. Archived from the original on 7 May 2009. ^ "Cuban Bread: A History". Bread-Maker website. Archived from the original on 2008-12-24. ^ Sara Kennedy (14 August 2002). "Viva El Cubano". Creative Loafing Tampa. ^ a b Enrique Fernandez (9 August 2007). "Our search for a good Cuban sandwich takes a surprising turn" (PDF). The Miami Herald. Archived from the original (PDF) on 2009-07-31. ^ a b Beyer, Jeanette (18 October 1934). "Jeannette Beyer Discovers Many Charms of Florida". Mason City Globe Gazette. Retrieved 9 September 2016. ^ a b Thomas C. Tobin (18 January 2003). "To each, his own sandwich". St. Petersburg Times. ^ a b c Houck, Jeff (6 Sep 2009). "Rebuilding the perfect Cuban". The Tampa Tribune. Archived from the original on 2010-04-26. ^ a b Stern, Jane and Michael (2009). 500 Things to Eat before It's Too Late and the Very Best Places to Eat Them. Boston: Houghton Mifflin Harcourt. ISBN 978-0-547-05907-5. ^ Junior League of Tampa (1961). The Gasparilla Cookbook (1st ed.). Favorite Recipes Press. ISBN 0960955607. ^ Adam Rugg (11 August 2006). "Tampa Cuban Quest: La Teresita". Eat Foo. ^ Raquel Rábade Roque, The Cuban Kitchen (Alfred A. Knopf, 2011), p. 80. ^ Glenn M. Lindgren, Raúl Musibay & Jorge G. Castillo, Three Guys from Miami Cook Cuban (Gibbs Smith, 2004), p. 390. ^ Becky Mercuri, American Sandwich: Great Eats From All 50 States (Gibbs Smith, 2004, p. 31. ^ Guzzo, Paul (29 March 2017). "Cuban Sandwich Festival has become International Competition". tbo.com. Tampa Bay Times. Retrieved 4 April 2017. ^ Hallock, Betty (12 May 2014). "Chef star Jon Favreau to sell Cubanos from pop-up El Jefe". Los Angeles Times. ^ Christopher Spata, (23 August 2016). Here's how one writer invented National Cuban Sandwich Day, Tampa Bay Times. Lastra, Frank (2006). Ybor City: The Making of a Landmark Town. University of Tampa Press. ISBN 978-1-59732-002-3.